A Tortured Soul. On This Evil Night, their fourth studio album. That album art. It all sounds creepy, even horrifying. Could it be some infernal death metal? Nope. This American plays classic heavy metal albiet touched with some dark and doom elements. Think some King Diamond and Mercyful Fate mixed with a touch of Judas Priest and Candlemass. Moreover, A Tortured Soul's reminds me of the American side of New Wave Of British Heavy Metal. That twin guitar harmony and soaring classic metal leads. Also, they have some brisk pacing at times, definitely leaning to speed and power metal, but more often then not tempered with heavy moderation. The bottom end is thick at times, slightly plodding, which gives me that doom metal feeling. Vocalist Maya Khairallah has a clean style, yet with more than a little melodrama going from direct and forceful to pitched screamo. Now, I don't have the lyrics, but the song titles suggest something fearsome and foreboding: On This Evil Night, Black Dragon, Waiting For Death, The Ripper's Curse, and Murdering. Creepy. Again.Maybe we don't need to see the lyrics. Mostly, overall, I was impressed with the twin guitar harmony and thrilling lead guitar solos. On This Evil Night is a very guitar forward or centered album. Yet the fiery solos are sometimes balanced by lighter guitar lines as within the latter half of Dreams, throughout All Alone, and at the start of Mourning Son. Some kudos should be given to fine bass line presence, especially within Smoke and Mourning Son. It's kind of funny, perhaps ironic, Mourning Son, despite the title, is one of the more upbeat and lively songs here. Bottom line: for all the dark and fearsome themes, and that awful album art, A Tortured Soul's On This Evil Night is mighty powerful, guitar driven, classic American heavy metal, and definitely worth your interest. Recommended. 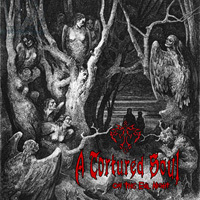 For all the dark and fearsome themes, and that awful album art, A Tortured Soul's On This Evil Night is mighty powerful, guitar driven, classic American heavy metal, and definitely worth your interest. Recommended.